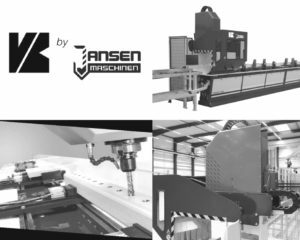 Vernet Behinger, widely recognized as a specialist in the design and manufacturing of the machine tools and fully automatic production lines for steel an lattice mast construction, has logically turned to new horizons by engaging new partnership with German Manufacturer Jansen Maschinen and by moving its drilling machines capability forward with new simple and cost-effective solution. This machine, called KBA40, will be of particular interest for light metal fabricating workshops looking for a versatile machine with compact footprint. Being able to process all type of steel profiles (H-beams, channels, gussets and angle bars), the KBA40 offers an economic drilling and tapping as well as milling and nibbling of small and large workpieces, long parts, single and series part production. This new machine can also be suitable for round tubes processing, this function being available in option. The straight and mitre cuts can be easily accomplished with high performance band saw optionally installed in line with KBA40. Simple and user-friendly, it can be handled by every operator with minimal training overheads. Thanks to its high flexibility, the operators are also granted the ability to work in multi-parts mode as well as to prepare the next program while the machine is operating. Vernet Behringer will be showcasing this machine during MACH TOOL fair in Poznan from 5 to 9 June. Take the opportunity to see the equipment in action at live demonstrations on booth 44, hall 5.